Stallion Alert - Record Collecting - Portland, OR: 600th Post: The Tide is Turning. This is not a picture of my actual turntable, but this is the same turntable that I have. I've owned it for years, but for much of that time it's been in semi-working condition and I haven't been using it. 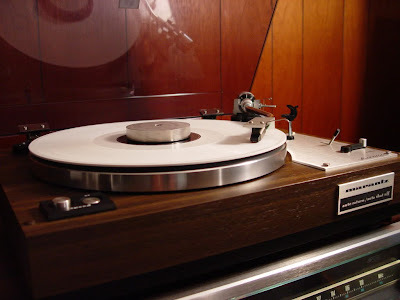 The left channel would always cut out, and it made listening to my LPs an exercise in frustration. I finally got it back from the repair shop after a lengthy stay there (think I might have mentioned this before), and it sounds better than ever. Not sure why I'm mentioning this. Guess I'm just excited about it. It's definitely given me a reinvigorated interest in playing my records, and that's not a bad thing. For anyone interested, it's a Marantz 6100. Fully automatic, and really nice looking. I'm happy. So that's that. As you may know, because I've mentioned here a few times, I'm always in the process of replacing my CDs with vinyl copies of the same album. I then sell the CD versions and put the profits towards either more records, or - currently - seasons of The Sopranos. So, not only have I been buying new records, but I've been losing some of my compact discs. I spent some time and went back and changed the posts where I now have the LP copy of something that I had the CD version of when I originally posted. The numbers are up to date. And for the first time since I started writing this blog, LPs have overtaken CDs. The score is now 266-272, with vinyl holding onto a six-disc lead. 49% CDs, 51% vinyl. And that's rounding the decimals up. Everything else stayed relatively the same. 90's Rock is still in first, followed by 90's hip hop, with 2000's rock barely edging out 2000's hip hop. 70's rock is still ahead of 80's rock, but only by one album. Possibly most impressive: I've made 600 posts. Yikes. And we're just starting out on the P's. Still a long way to go.